In this series of articles I am going to test the noise performance of some low noise amplifiers. This first part of the series is about the test equipment used for the noise measurements. Figure 1, block diagram with the functions of the noise measurement setup. The input can be connected to a signal generator. The input voltage is divided by 10 million (140 dB), by a high precision attenuator. This provides a very low level, but well defined test signal at the input of the amplifier(s) under test (test amp 1 and 2). Two amplifiers under test can be measured at the same time, via the two channels of the spectrum analyser. The output impedance of the attenuator is only 0.01 Ω, this will result in a very low thermal noise generated by the attenuator, only about 0.0127 nV/√Hz at 20 °C. This means, the noise you measure at the output of the amplifiers is generated almost entirely in the amplifiers themselves, and is not coming from the input attenuator. Then the signal (test signal + noise) from the amplifier under test is again amplified by an output amplifier with 60 dB gain, to make it measurable with a spectrum analyser. The level of the test signal above the noise floor as displayed on the spectrum analyser, provides us a way to determine the input noise of the amplifier under test. Figure 2, a picture of the test setup. On the left side are the input connectors and the input attenuator. On the right side are the two output amplifiers, and the output connectors, for connecting the spectrum analyser. The board with the power supply filter is placed vertically, also on the right side. There are two open spaces, where I can place the amplifiers under test. Figure 3, The input attenuator. There are two input connectors (L and R) , this is because I also want to connect a stereo CD player to the input sometimes. When a signal generator is used, it is connected to both the L and R input in parallel. The left and right input signals are combined by resistors R7 and R8. Resistor R6 (99.7 kΩ) is with a digital Ohm meter selected from a bunch of 100 kΩ resistors. The signal generator I use, has an output impedance of 200 Ω. Together with R7 and R8 parallel, and R6 in series, we get then almost exactly 100 kΩ. Five of these resistors are in parallel, so we get 0.01 Ω. The circuit of the test setup is build in an aluminium box, to screen it from electric interference fields. The input connectors are mounted electrically insulated from the box. The ground wires from the input connectors are wired directly to the cold end of resistors R1 ... R5. This ensures maximum accuracy of the input attenuator. 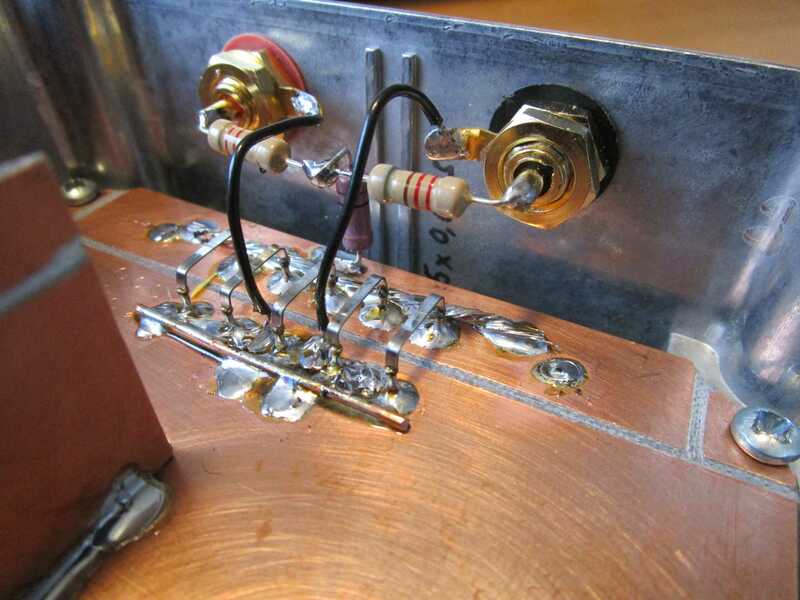 Figure 4, detail of the input attenuator. The five 0.05 Ω resistors, are the five metal bridges you see. The input connectors are insulated from the box with the red and black plastic insulators. Along the connections of the 0.05 Ω resistors, I soldered thick copper wires (1.5 mm²). The resistance of the PCB copper layer alone is just not low enough. A piece of 1 x 1 cm copper layer (0.035 mm thick) has a resistance of about 0.5 mΩ. At first I had the thick wires only at the back side of the PCB board (see next picture). But by doing this also at the top side of the board, the attenuator was made 0.3 dB more accurate, to exactly (as far as I can measure) 140 dB. Figure 5, The back side of the board, the leads of the 0.05 Ω resistors are also here connected together with thick (1.5 mm²) copper wire. The circuit works on a 12 volt supply voltage. The supply voltages are filtered with RC filters before they go to the amplifiers. This is to reduce interference coming from the power supply. And also reduces unintended coupling between the amplifiers via the supply rail, and trough this reducing the risk of oscillation. 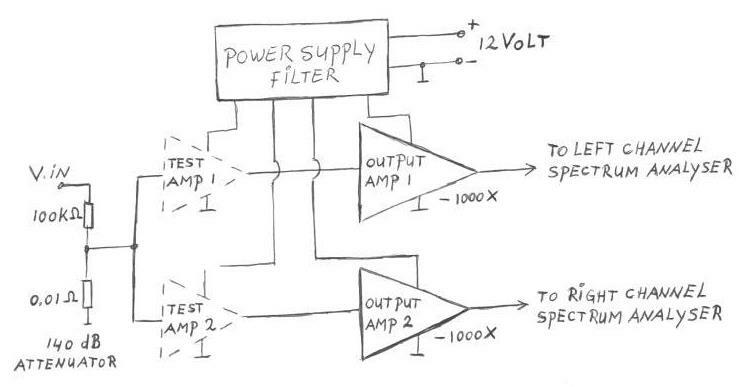 Figure 6, the power supply filter. 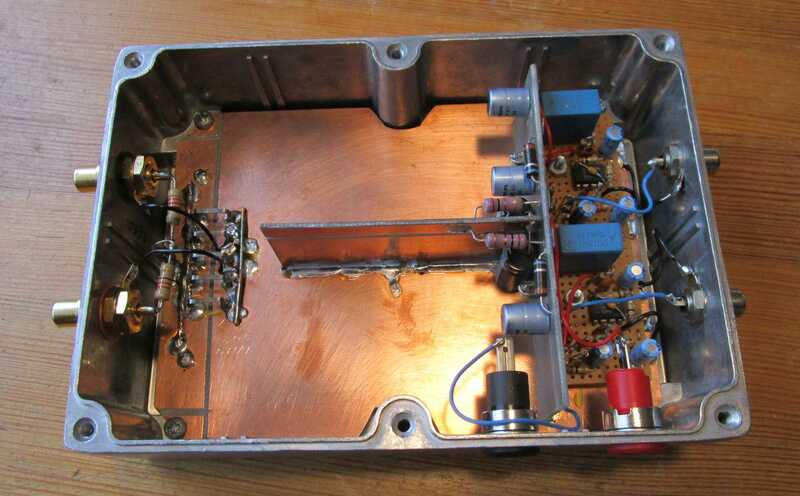 I am planning to give the amplifiers under test, a gain of about 60 dB. Let's say we use a test signal (out of the attenuator) of -140 dBV, then this 60 dB gain will bring the test signal to -80 dBV. The maximum input voltage at the spectrum analyser input is about +2 dBV. So we can use without problem another 60 dB of gain, to bring the test signal at -20 dBV. A gap of 22 dB between the test signal, and the maximum analyser input voltage is nice, as we also put wideband noise into the spectrum analyser, with which we don't want to overload the analyser input. 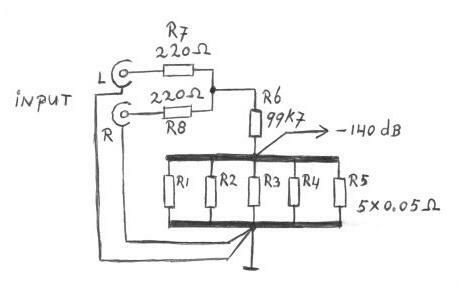 Figure 7, this is the circuit diagram of the output amplifier, both the left and the right channel have such an amplifier. The output amplifier consists of two stages, build around the LM833 operational amplifier (datasheet-LM833.pdf). The gain is divided over two stages, because this op-amp doesn't have enough "gain-bandwidth product" to give 60 dB gain over the entire audio spectrum in one stage. The first stage, has a gain of -R21/R20 = -56000/2200 = -25.454545 times. This stage is inverting the signal, for the noise measurements this makes no difference. The input capacitor C20 must be a plastic film capacitor, and not an electrolytic type, as the DC voltage across it, may be reversed depending on what the amplifier under test is doing. The second stage has a gain of: 1+(R24+R25)/R26 = 1+ 84200/2200 = 39.272727 times. 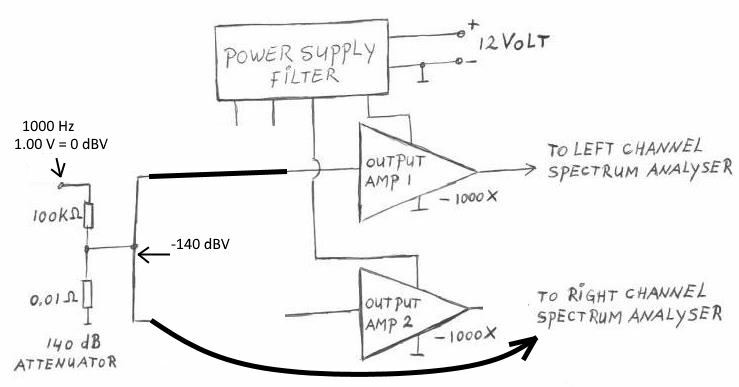 The total gain of the output amplifier is therefore: -25.454545 x 39.272727 = -999.67 times, so very close to -1000 times or 60 dB inverting gain. The resistors which determine the signal gain, are selected to have close tolerance, within 0.1 %. 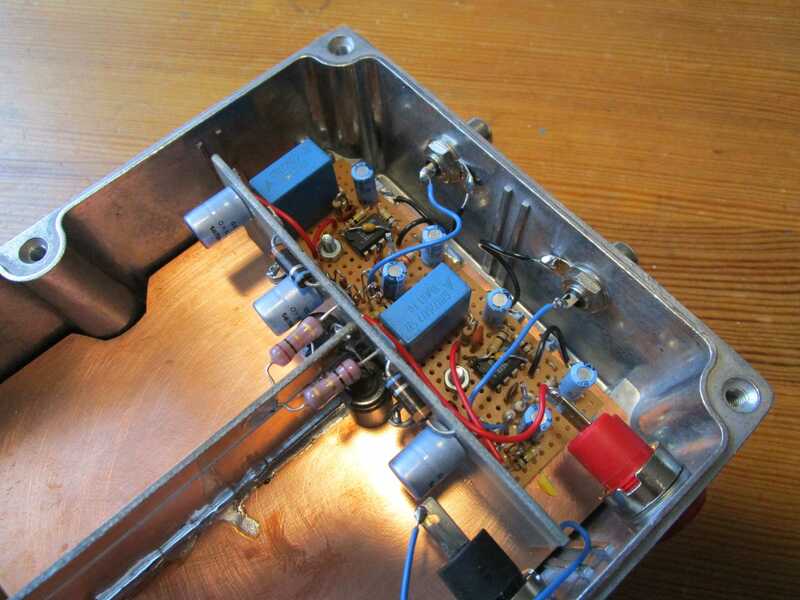 The bandwidth of the two stages is set to 60 kHz with capacitors C21 and C24. This ensures quite a flat response up to the 20 kHz we want to measure. The six diodes at the output protect the spectrum analyser input for too high input voltages, which especially can happen at switching on and of the amplifier. The gain is this amplifier is very precisely set to -1000, because I wanted to check the accuracy of the input attenuator with it. Figure 8, the output amplifiers for the left and right channel. The signal generator I use for the measurements is the Neutrik "Minirator MR1". That is a very handy battery operated device, it can for instance generate, sine waves, square waves, white noise and pink noise. The frequency of the waves can in certain steps be set from 20 to 20000 Hz. For instance, one frequency setting is 1000 Hz, and the next one is 1250 Hz. The output level can in steps be set from 0.13 mV to 1.6 Volt RMS. The output voltage is very accurate, on the 1.00 Volt setting, I measure 0.998 V RMS on a digital voltmeter. 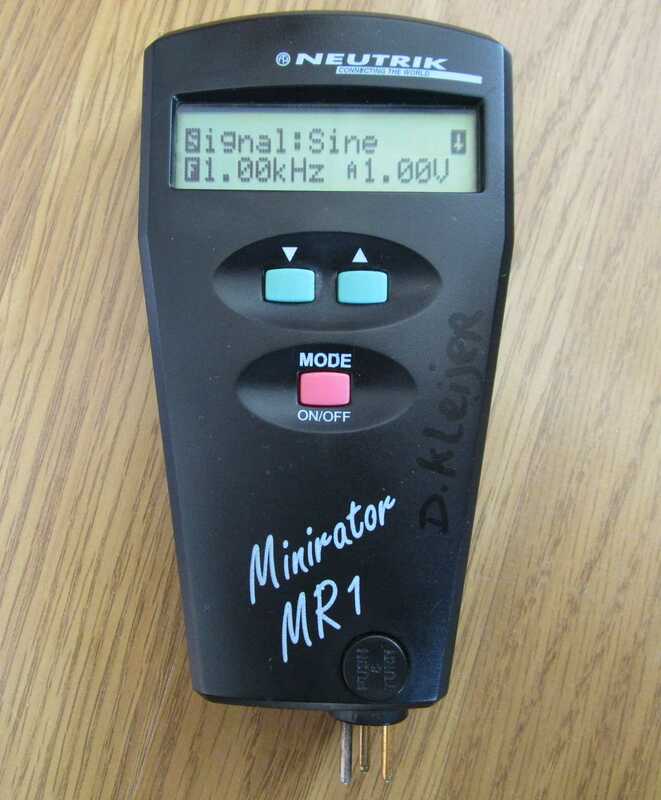 Figure 9, the Neutrik "Minirator MR1" signal generator. On the top side of the device is a cinch output connector, and on the bottom side as you see a XLR connector. The output impedance of the generator is 200 Ω. As spectrum analyser I use the sound card of my PC, with the program: Visual Analyser, (version: 10.0.5 NE) running on the PC (go to the Visual Analyser download page). 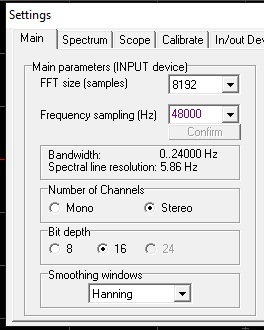 Figure 10, these are the main settings I use for the spectrum analyser. The analyser displays the audio spectrum in certain small blocks of frequency, in analyser terms these blocks are called: bins. With the settings from figure 10 , the bins are 5.86 Hz wide. You can select a certain window function, which determines how a discrete tone is displayed on the spectrum analyser, for instance how wide the peak in the spectrum is, and how steep it falls off. I use the Hanning window function. With the Hanning function, the noise bandwidth is 1.5 times the bin width. The bin width is in this case: 5.86 Hz, so the noise bandwidth becomes 8.79 Hz. When your input signal is noise, the noise bandwidth determines the level at which the noise is displayed. Doubling the noise bandwidth, means double the noise power per bin, and a 3 dB higher value for the noise measured.. But heights of discrete tones are not affected by the setting of the noise bandwidth. Figure 11, frequency response of the spectrum analyser. For this test, a white noise signal is connected directly to the spectrum analyser inputs. "White noise" contains an equal amount of noise power for every Hz in the spectrum. With such a signal , we can determine the frequency response of the spectrum analyser. The level of the white noise signal must be set so high, that it is as least 15 dB higher then the noise floor of the analyser itself. The displayed amplitude is the average of 200 measurements, this average function removes most of the noise you see. And it becomes possible to read the amplitude with 0.5 dB accuracy. As figure 11 shows, the response is very flat over the entire frequency range. The window function can also be set to: no window function (select: none) , in that case the noise bandwidth is equal to the the bin width. Switching the window function from "none" (noise bandwidth = 1 bin) to "Hanning" (noise bandwidth = 1.5 bin), should in theory increase the measured noise level by 10.log (1.5) = 1.8 dB, and that is indeed what I measure. Another window function is the "Flattop function", which has a theoretical noise bandwidth of 3.83 x the bin width. Switching the window function from "none" to "Flattop" should increase the measured noise level by 10.log (3.83) = 5.8 dB. But strange enough, I only measure 4.8 dB increase when doing this. For that reason I don't use the Flattop window function. And now some tests of the test setup itself. At first, the spectrum analyser is calibrated by putting 1.00 V RMS, 1000 Hz directly to it's inputs. The dB scale is shifted, to get the measured signal exact at 0 dB. Figure 12, testing the test setup. The -140 dBV signal is connected directly to the right channel (red in the next diagram) of the spectrum analyser. And for the left channel (green), it first goes through the output amplifier. Figure 13 , The red line is the input noise floor of the spectrum analyser. On the spectrum analyser input is the 1 kHz signal of -140 dBV (0.1 μV) , but this is not visible on the red line because it is 21 dB below the noise floor of the spectrum analyser. For the green line, the output amplifier (60 dB gain) is inserted between the -140 dBV signal and the spectrum analyser input. The -140 dBV signal is amplified by 60 dB to -80 dBV, and is now clearly visible in the green line. The noise level on the green line is about -93.5 dBV at 1 kHz, and this is the output noise of the amplifier. For the amplifier input noise, we need to subtract the gain of the amplifier, and get -93.5dBV - 60dB= -153.5 dBV. The spectrum analyser has a noise bandwidth of 8.79 Hz. If the bandwidth would be 1 Hz, the power of the noise would be 8.79 times lower, or 9.44 dB lower. The amplifier input noise is then -153.5 dBV - 9.44 dB = -162.94 dBV in 1 Hz bandwidth. This means the input noise voltage of the amplifier is: 7.13 nV in 1 Hz bandwidth (10 to the power -162.94 / 20 = 7.13 nV), or in other words; the amplifier input noise is 7.13 nV/√Hz. In figure 13, we see the amplifier is picking up some hum at 50 Hz, 150 Hz, and 250 Hz. But that doesn't bother me at the moment. The 1 kHz signal is at -80 dBV, exactly where it should be. And now the input noise of the spectrum analyser (the red line in figure 13). At 1 kHz, we see a noise level of -119.3 dBV, this is the analyser input noise in 8.79 Hz bandwidth. For 1 Hz bandwidth we need to subtract 9.44 dB and get: -119.3 dBV - 9.44 dB = -128.74 dBV. This is equal to 366 nV/√Hz. at 1 kHz. At lower frequencies the noise even increases. Compared to the 7.13 nV/√Hz we found for the output amplifier, this is very noisy. But this spectrum analyser (PC sound card) is just designed for much higher input voltages, to more then 1 Volt. 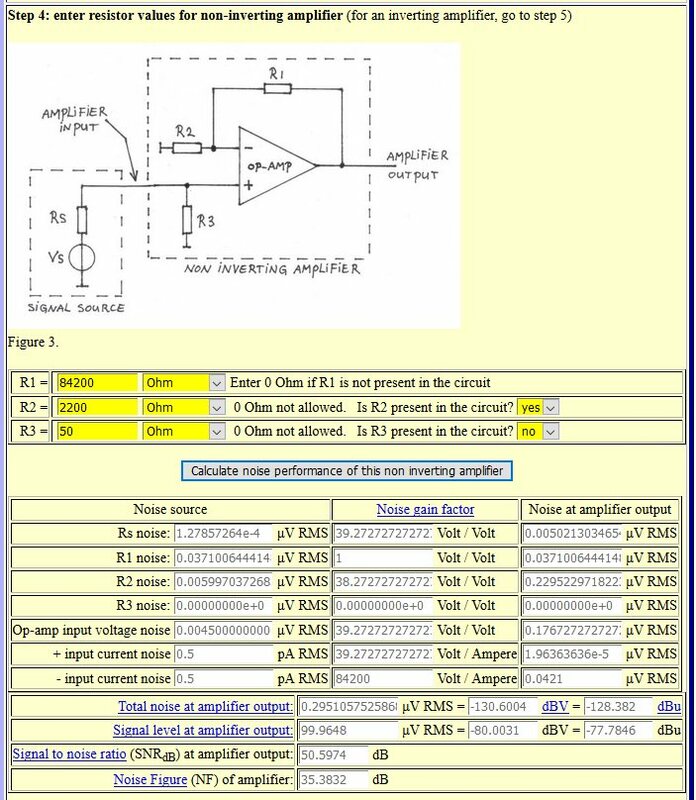 While the amplifier is designed for lower input voltages, and has a maximum input of about 1 mV. In the measurement, we found for the output amplifier an input noise of 7.13 nV/√Hz. Let now calculate how much the input noise should be in theory. For this, we can use my op-amp noise calculator . 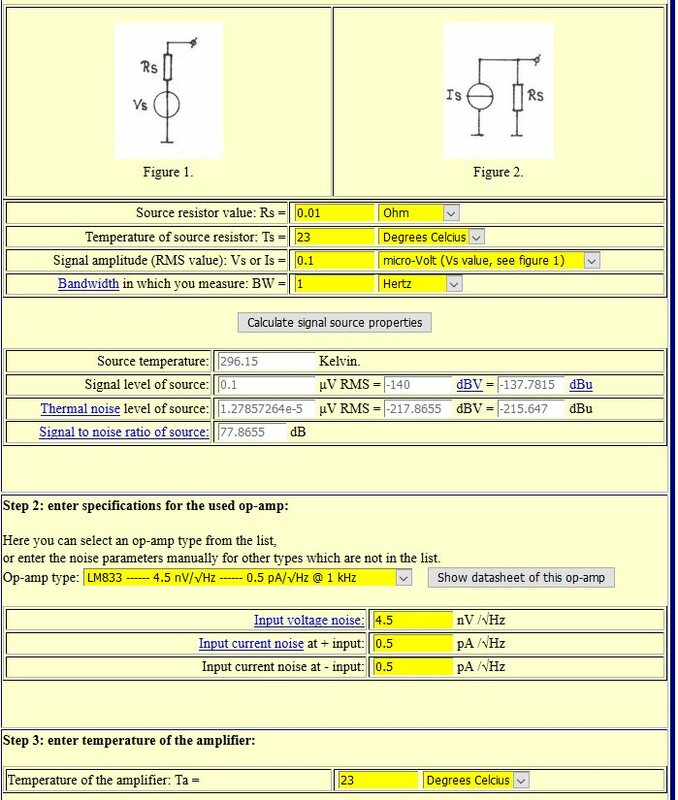 Figure 14, this is a screenshot from the noise calculator, where I specified the signal source, the op-amp, and the temperature. Figure 15, In this screenshot of the noise calculator, the resistor values of the first stage are specified, and the noise is calculated. What we need is the "total noise at amplifier output" which is here calculated at 0.1979 μV RMS. When we divide this by the gain of this first stage, we get the input noise. 0.1979 μV / 25.454 = 0.007775 μV = 7.775 nV in 1 Hz bandwidth. And now the second stage of the output amplifier. The source resistor is now changed to 1 Ω, which I think is about the output impedance of the first stage. 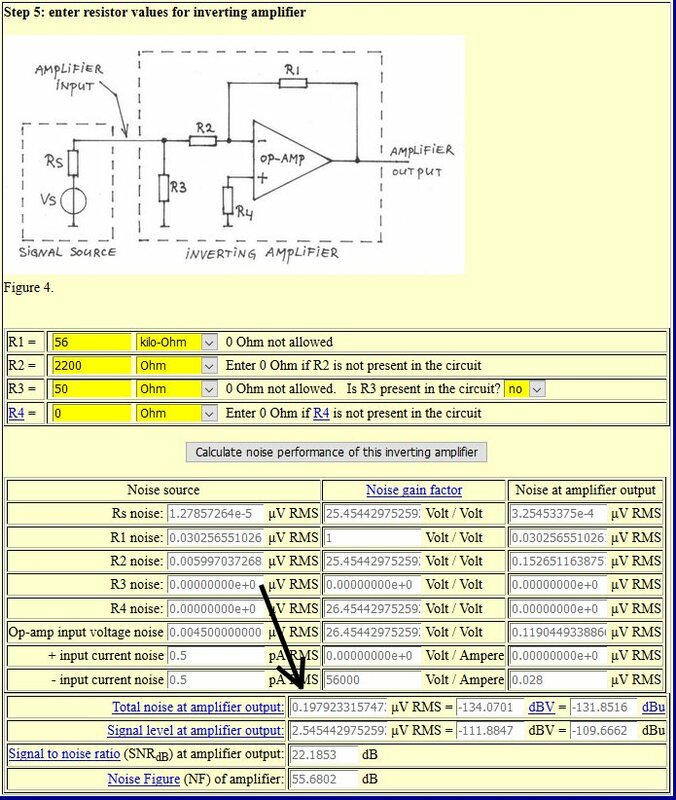 And the signal amplitude is changed to 2.5454 μV, which is the output voltage of the first stage (for the noise calculation, it is actually not important what signal amplitude you enter). Figure 16, the noise calculation of the second stage of the output amplifier. Now take the total noise at amplifier output (0.295 μV) and divide this by the gain of stage 1 and 2 together (= 1000). By this, we refer the output noise of the second stage back to the input of the first stage. There we go: 0.295 μV / 1000 = 0.295 nV in 1 Hz bandwidth. We thus find the first stage contributes 7.775 nV/√Hz at the amplifier input noise. And the second stage 0.295 nV/√Hz. Together this is √(7.775² + 0.295²) = 7.781 nV/√Hz. We see almost all of the amplifier input noise is caused by the first stage. This is typically for amplifiers with enough gain; the first stage determines almost entirely the input noise level. So, we found a theoretical input noise of 7.781 nV/√Hz. And with our test setup we measured 7.13 nV/√Hz. The measured value is slightly better then the theoretical calculated value. The difference is however only 0.76 dB.